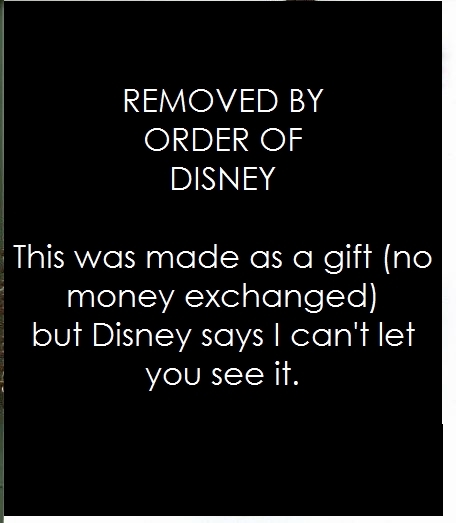 Click on the thumbnail to see the image enlarged or the linked word "Pattern" to get the pattern for the piece. All designs are mine unless otherwise stated. 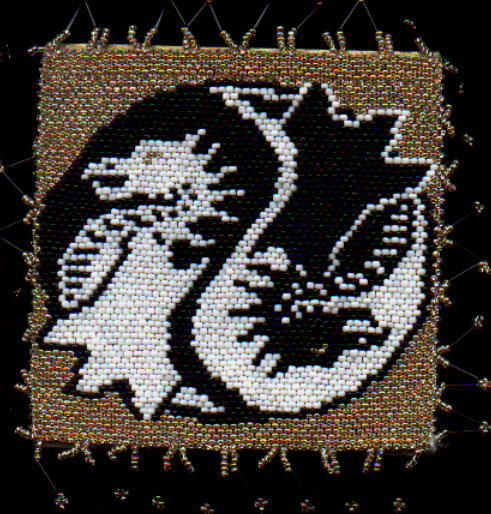 Techniques used are clickable links to instructions for that particular stitch. The variance in bead size gave me some problems with this pattern, so it turned out a bit stretched. 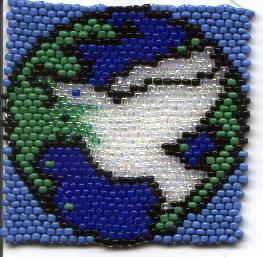 This is using my old bead template, and I have since made a new one with a better average bead size. I used the Brick Stitch. 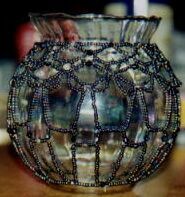 This was done with netting/lace methods. 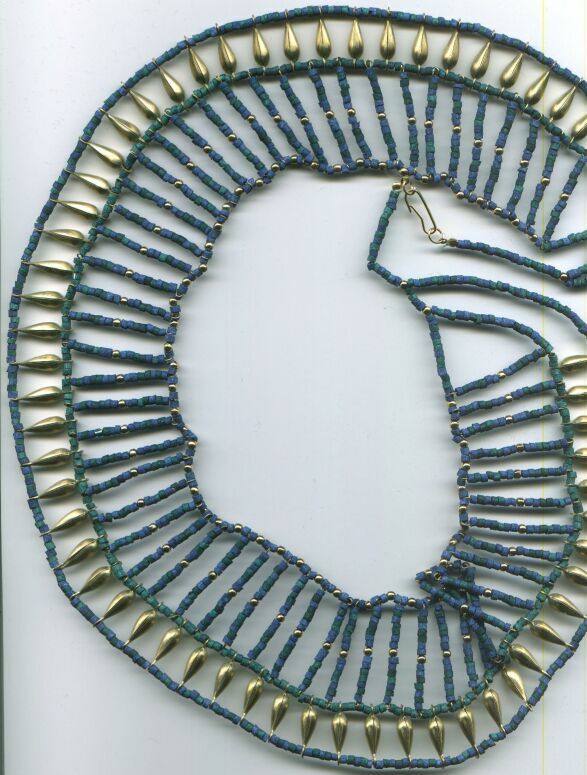 The pattern is from "At Last You Can Bead On Glass," which is reviewed on the beading books page. No pattern available, I just did it without one. Tubular Brick Stitch around wooden ornament shapes. The rainbow one isn't particularly Christmasy, but I like rainbows because a) the colours are nice, b) they're a symbol of racial harmony, and c) they're a symbol of harmony between people with varying sexual preferences. No pattern available, I just did them without one. The lid top and the bottom of the box are circular brick stitch, although I did the bottom circle backwards, because I started with the tubular brick stitch around the sides first, then connected it down to a circular stitch. The lid also features netted drops (which I don't have instructions for yet) that hang properly, except it is upside down for the scan. I stuck the lid circle on with a gluestick, plus some stitches through the top for reinforcement. I used the glue stick for the first few rows of the tube around the box to anchor them in place, measured to where the lid comes down, and then again a bit on the bottom circle. I painted the parts of the box to be beaded white first, but not where the lid and bottom meet, because I didn't want it to stick shut. 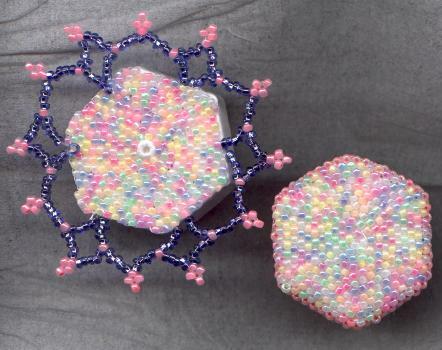 These were all made with 2.5 inch styrofoam balls, and covered using a combination of tubular brick stitch and circular brick stitch. I did the happy face because it amuses me, and again, I like rainbows for the reasons mentioned above. This is the Don't Panic guy from Hitchhiker's Guide to the Galaxy. 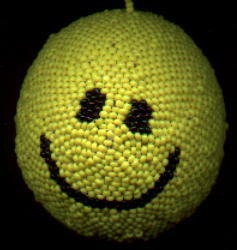 It was made with a 2.5 inch styrofoam ball, and covered using a combination of tubular brick stitch and circular brick stitch. The upper arms are tubular brick stitch around long straight pins, the forearms are just beads on the thread. 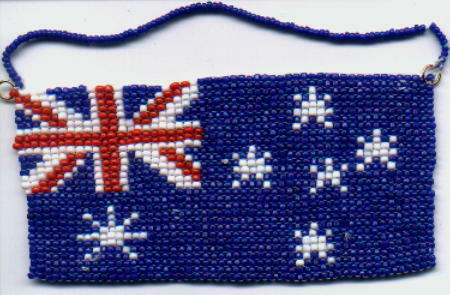 The hands are stitched onto the ball's beads, as is the tongue, which was made with normal brick stitch. No pattern available, I just did it by looking at a picture. I made this box for my role-playing dice. At some point, I'll actually get around to finishing the sides, which will have another style of dragon. I used the brick stitch. Pattern inspired by a graphic I found at Here There Be Dragons Artwork Site, under Clip Art. The webmaster there said she can't remember where she got it, but thanks to Holly for emailling me to say that she remembers it from an old Dragon Magazine on a Deck of Many Things! Someone on a beading list mentioned having a weekend where all they got in the way of crafting was sticking googly eyes on things, because their grandkids were over. 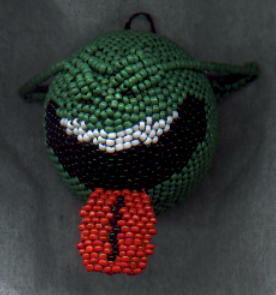 In my utter insanity, I decided to put googly eyes and beading together and create this. It rattles softly, and looks neat, but I'm not sure what to do with it. 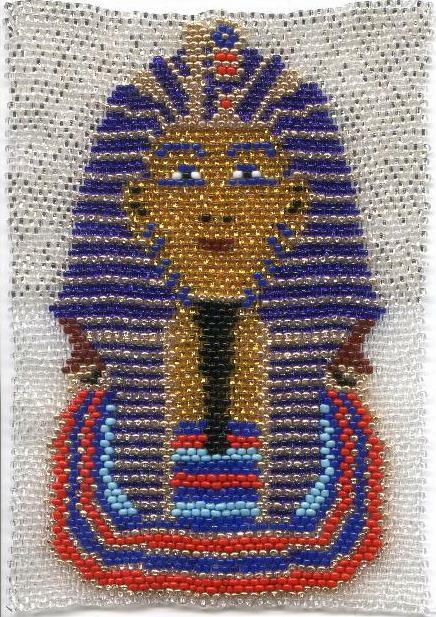 This was made using TWO kits from the book Fun With Beads: Ancient Egypt. 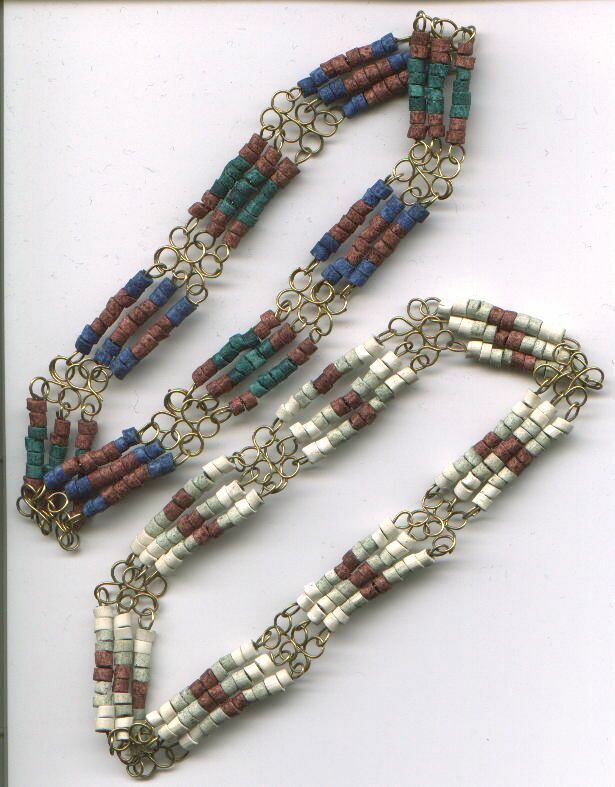 It is pictured on the cover of that book, but there are insufficient beads in the box to complete the necklace as instructed. Since I had two kits, I made the necklace larger than the instructions as well. 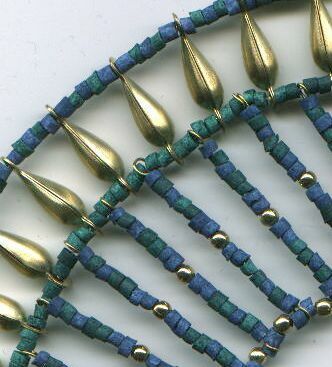 And actually, I counted; the necklace as pictured on the cover of the book has more bars than the instructions ask for. With the leftover beads from the extra kit mentioned above, I made these bracelets using instructions from the book as inspiration. They look nice, but the wire supplied with the kit is actually too soft for the loop structure to be effective; it is prone to stretching and ruins the loops easily. Also, I've had problems with the ends of the wire snagging on clothing, even though they're tucked in. This is largely because the stretching pops the ends out of being tucked in. 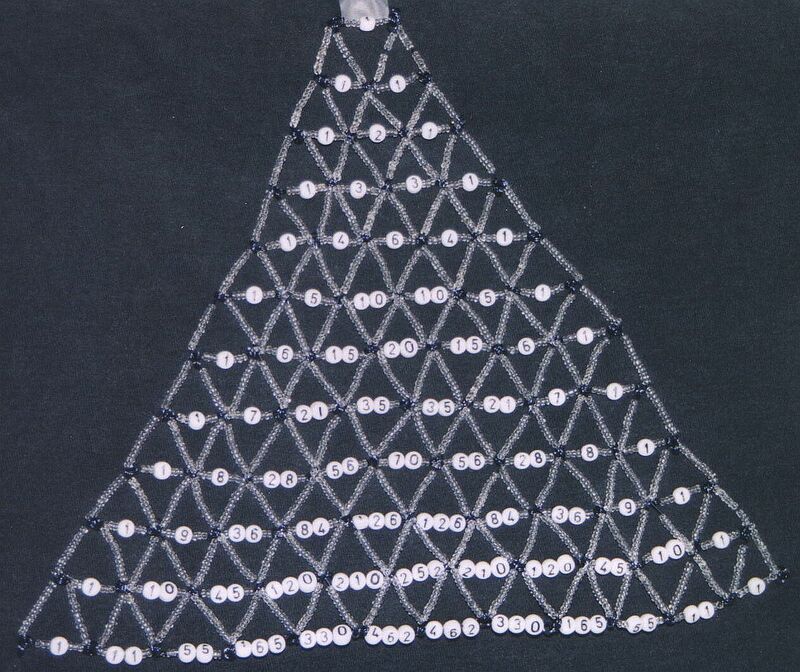 As proof of my ultimate geekery, here is a beaded rendition of Pascal's Triangle. It was a gift for my husband, who is a mathematician. Thanks to the patient staff at Love-R-Beads and my mother-in-law for helping me count out all the digits I needed in the store! 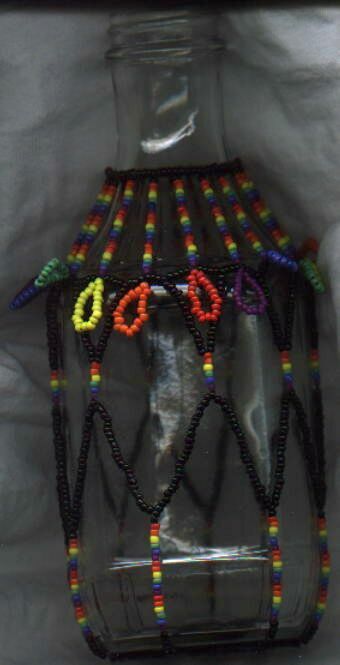 This is a "Soy Vey Veri Veri Teriyaki" sauce bottle (a delicious sauce, by the way), cleaned out and laced up with beads. No pattern available, sorry, I just did it through experimentation to see what would fit. This is another cardboard box, this time just the lid. 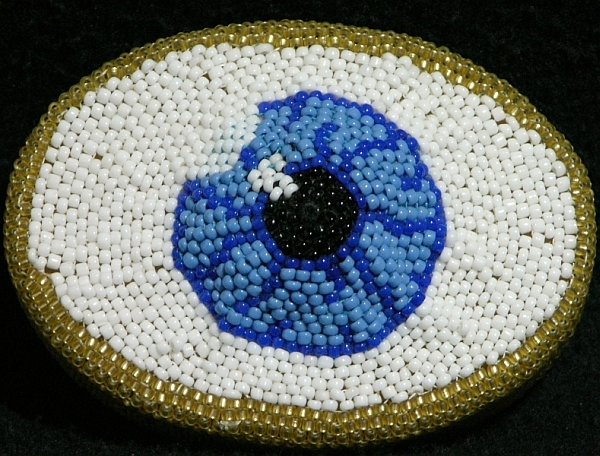 It is an eyeball (and can also be seen with other eyeballs on my collections page). 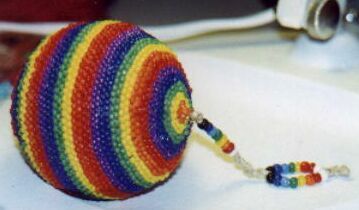 The centre was deliberately done with slightly tight concentric rows to give it a bit of a puff, and a cotton ball was put underneath for lift when the beaded portion was stitched to the box. Sorry, no pattern available, I just made it up as I went along. 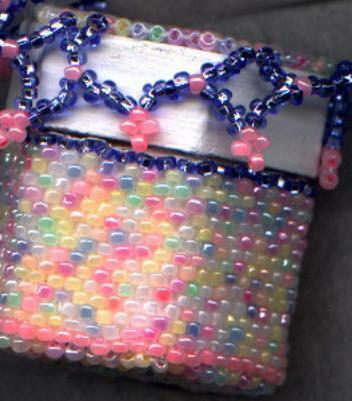 This is a simple tubular square-stitch tube with a rainbow pattern, designed to hold a stick of lip balm. It was stitched with heavy nylon thread for strength, as it is attached to a keyring and resides with other keychains and my keys. This allows me to carry lip balm around everywhere I go without it being left in the car to melt. Space is left at the back end to allow the dial to be turned.